Is your Center Harbor home causing you headaches? Are you dealing with issues that need repair badly, but you’re not sure where to turn for help? 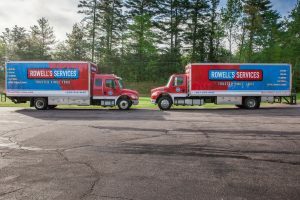 At Rowell’s Services, we have certified HVAC technicians and electricians and expert plumbers who are ready to come out and help you tackle even the most complex issues. We know that you need your home to work well so you can focus on the important things in life, and we’ll get you back to those just as soon as we can. We offer comprehensive repair, installation, and maintenance options on all things plumbing, electrical, and HVAC-related. No matter what you need to have done to make your home the best place it possibly can be for you and your family, we’ll get the work done so your home can be your castle once again. These are just a few of the services that we get calls for most frequently in Center Harbor. When your drains aren’t working, it’s easy to feel like your home isn’t liveable. Even if only one drain is affected, it can be hard to go about your normal routine without using it. No matter what has gone wrong, we’ll help you get your drains back to normal. When you have a problem with a single drain in your home, it’s usually just a matter of sending a plumbing snake through the drain until we find the clog and can remove it. All of our plumbers come equipped with professional grade snakes. These are more robust and easier to use than the ones you can rent at the hardware store. Combine that with a plumbers’ expertise and your drain should be cleared in no time. If you have a problem with several drains, we’ll look deeper into your system for the clog. It might be in a pipe somewhere or even in your sewer. No matter where it ends up being located, we’ll find it and remove it. If your sewer needs cleaning out, we’ll let you know and come up with a plan to get it taken care of so it doesn’t cause you any more problems. Many people in Center Harbor are on septic tanks, rather than relying on the city’s plumbing. When these tanks get full or have problems, our plumbers will come out and take care of things for you. We have state-of-the-art septic tank pumping equipment, which usually means that we can get your tank pumped out quickly and easily. Once that is done, you should be able to use your system easily again. Regular pumping is important for the life of your septic system. Get on our schedule now, so you don’t have to worry about this when it causes problems later. If you’re not sure how well your system is running or whether it needs to be pumped, we can assess that for you, too, and let you know. This type of maintenance can keep your system running for many years. You need your heating and air conditioning to run well in Center Harbor, or you could spend weeks or months very uncomfortable. It’s particularly essential that your heating system run well, or you could suffer ill health, frozen pipes, and even more difficulties. If your heater isn’t working, or it isn’t working as well as it did last year, give us a call. We’ll come out and determine what’s gone wrong, then we’ll get it fixed for you as soon as we can. If we have to order parts, we’ll make sure you can stay warm until they come in and we’ll keep you updated throughout the process. Maybe it’s time for a new heater or air conditioner! We’ll come out and make sure you get the right one for your family and your home. This involves looking at the size of the house and your budget, as well as thinking about your energy efficiency preferences and how hard you ask your heater to work. We’ll recommend units from companies that we trust. Once you’ve chosen your new heater or air conditioner, we’ll order it and get it installed for you once it’s in. We’ll also make sure that you understand how to maintain it and use it, so you can get the most out of your new purchase. Call us today or whenever you have a problem with your home! We love being part of the community in Center Harbor and we would love to show you why so many people there choose to work with us.